Although I didn't always think so, pumpkin and chocolate is such a great combination. 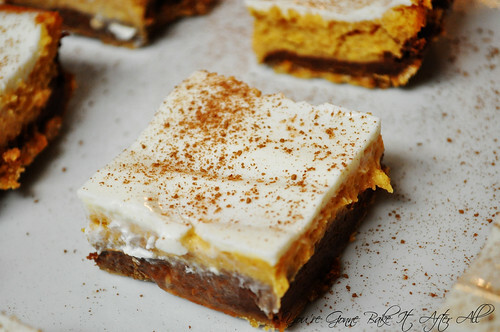 Years ago in the fall, one of my labmates brought these Pumpkin-Chocolate Cheesecake Bars to a lab meeting. They are similar in theory to the Chocolate-Pumpkin Cheesecake Bars, but in these bars the chocolate and the pumpkin are layered rather than swirled, and the crust is graham cracker rather than chocolate cookies. These bars also have a delicious sour cream topping, and if I remember correctly, the cheesecake layers in these bars are slightly less firm than the Chocolate-Pumpkin Cheesecake Bars. I am happy to have both bar recipes to make during my favorite time of year! 1. Preheat oven to 325F. 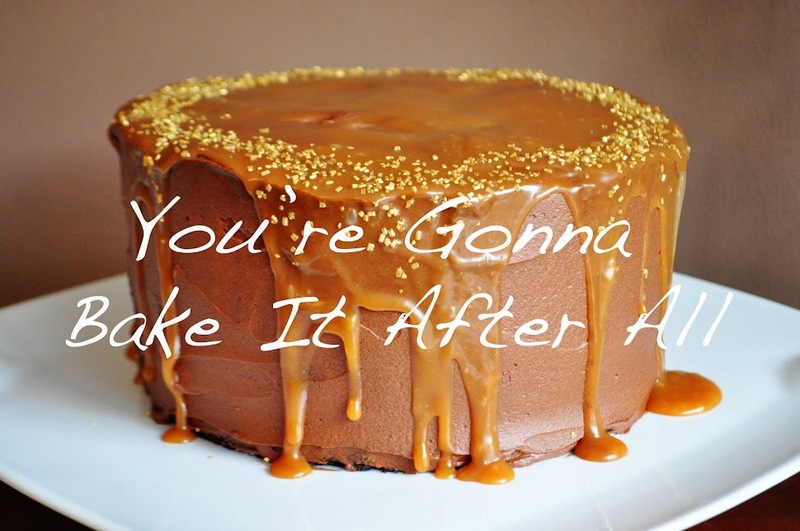 Lightly grease a 13x9-inch baking pan; set aside. 2. In a medium bowl, combine graham cracker crumbs and 1/4 cup sugar. Stir in the 1/3 cup melted butter. Press mixture evenly into bottom of the prepared baking pan; set aside. 3. In a large bowl, combine cream cheese and the 1 3/4 cups sugar. Beat with an electric mixer on medium speed until smooth. Add eggs, one at a time, beating on low speed after each addition just until combined. Beat in pumpkin, pumpkin pie spice, cinnamon, vanilla, and salt on low speed just until combined. Remove 1-1/4 cups of the mixture and set aside in a separate bowl (this mixture will have the chocolate added to it). 4. In a small heavy saucepan, combine the 6 ounces chocolate, the bourbon if using, and the 2 tablespoons butter. Cook and stir over low heat until melted. Whisk chocolate mixture into the 1 1/4 cups pumpkin mixture. Pour over crust, spreading evenly. Bake for 15 minutes. 5. Carefully pour the remaining pumpkin mixture over baked chocolate layer, spreading evenly. Bake for 40 to 45 minutes more or until filling is puffed and center is set. Cool on a wire rack for 30 minutes. 6. In a small bowl, combine sour cream and 1/4 cup sugar. Gently spread over bars. Cool completely. Cover and chill for at least 3 hours. Cut into bars. * Before serving, sprinkle with nutmeg and/or chocolate curls. *To make triangle-shape bars, cut the cookies crosswise into four strips. Then cut each strip into five triangles (you'll end up with two half-triangles from the ends of each strip). To Make Ahead: Bake and chill as directed; cut into bars. Place in a single layer in an airtight container; cover. Store in the refrigerator for up to 3 days. Do not freeze.